Part One of this two-part series, on the exploitation of the Yazidi Genocide for political purposes, can be accessed here. On the same day that the Kurdistan referendum on independence was held, the Assyrian Confederation of Europe (ACE) released a report (primarily authored by Reine Hanna but to which I also contributed) on the situation of Iraq’s Assyrian Christians. Over 100 pages long, the report details a number of serious violations that the Kurdistan Region Government (KRG) is committing against Assyrians as it attempts to consolidate control over the Nineveh Plain, an important Assyrian homeland. This project of annexation has been a long-term strategy, but it intensified this year ahead of the independence referendum regarding the future status of the Kurdistan Region of Iraq (KRI). 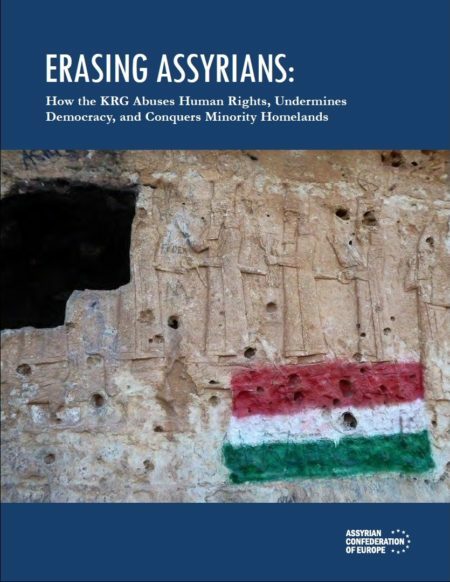 The report is entitled “Erasing Assyrians: How the KRG Abuses Human Rights, Undermines Democracy, and Conquers Minority Homelands” (click the title to download the full report). It covers such issues as voter fraud, land theft, the deposing of democratically elected officials and their replacement with unelected party-appointed KDP personnel, and the strategy of co-optation pursued through the KDP’s patronage system. During this past summer, the KDP removed the mayors of two important Christian towns in the Nineveh Plain: Faiez Abed Jahwareh of Alqosh and Basim Bello of Tel Keppe (Tal Kayf). The KDP’s removal of the two elected and longstanding mayors, both of who are unsympathetic to the aims and policies of the KDP, suggest a strategy of preparing to annex the region to Kurdistan. [Deposing the mayors] was accomplished through the KDP takeover of the Nineveh Provincial Council, which is led by Bashar al-Kiki, a member of the KDP. Thirty-one of the council’s forty-one members belong to the KDP. The KDP has worked to install its own loyalists in the Nineveh Governorate for years, and it often succeeded in doing so in local districts within Nineveh (Sinjar being a prime example). However, the Nineveh Governorate became increasingly vulnerable to this manipulation following the events of 2014, when governance in Mosul collapsed and government offices serving the then-displaced residents of Nineveh had to be reopened in Dohuk. The affiliation of the Nineveh Governorate with the Central Government in Baghdad is therefore becoming progressively more illusory, as the KDP is able to implement policy through Nineveh while pretending to remain separate from it. After removing Alqosh’s mayor, the KDP-controlled Alqosh District Council appointed Lara Yousif, an Assyrian KDP member, as the new mayor, without an election. 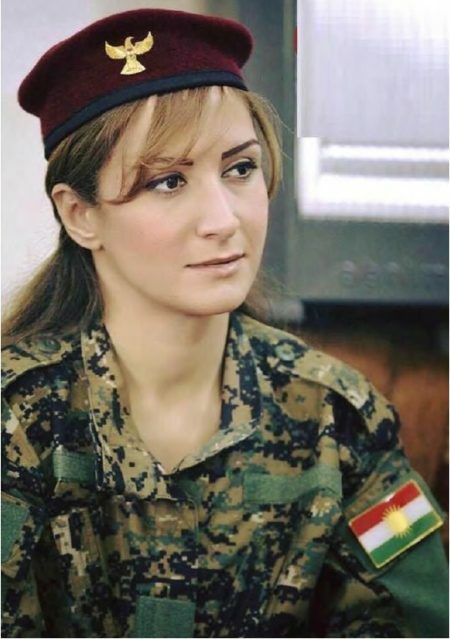 Lara Yousif was [previously a] schoolteacher who has not served in the military, but she was presented in official photos wearing a Peshmerga officer’s uniform. She also has no experience in politics and has never held a public office. Town residents have expressed frustration at the media’s misguided portrayal of Yousif’s appointment. Being appointed by a powerful political apparatus—rather than achieving a post through one’s own accomplishment and merit—is not a victory for women’s status in Iraq. When Basim Bello, the elected mayor of Tel Keppe, was removed from office following the forced change of leadership in Alqosh, Bello said in an interview that “the reason for both his removal and Faeiz Abed Jahwareh’s removal in Alqosh are part of the KDP’s plan to eliminate opposition to KRG annexation. Bello feels that he was specifically targeted as he has been an outspoken critic of the KDP for many years” (32). “According to Bello, the rift between the ADM and the Kurdish parties began in 2003 as the KRG attempted to expand its political control further into Christian areas of the Ninewa plain. The deposing of the elected Nineveh mayors and their replacement with KDP members was accomplished through official structures of the Nineveh Governorate—not the KRG. This was made possible by filling both district and provincial councils in Nineveh with local minority figures on the KDP payroll. (This strategy is linked to that of the “patronage system” touched upon below.) These councils then issued the various orders to depose/appoint the officials mentioned above. After 2003, the KDP used a similar approach to take over the local government of the Sinjar District, which is one district within the Nineveh Governorate. Iraqi forces based in the Sinjar area were often commanded by Kurds with loyalties to the KDP, who then allowed the Party to establish a Peshmerga and asaish presence there. Enjoying this dominant military/asaish power in Sinjar, the KDP could place its own figures into positions of local administration, without holding elections. Before long, Sinjar fell outside of the control of the Nineveh authorities, even though the District remained the financial responsibility of the Nineveh Governorate. Yazidi community leaders in Sinjar once described to me an incident (occurring several years before the Yazidi Genocide), in which then Nineveh governor Atheel al-Nujaifi tried to visit Sinjar. KDP personnel in Sinjar put a mob of youth “protesters” together to prevent him from engaging with the local officials there; the young men threw rocks at his motorcade until he had to simply turn around and drive back to Mosul. Sinjar had become a no-go zone for non-Kurdish authorities, and Yazidis who joined non-Kurdish parties were frequently arrested or targeted with political violence. The KDP has targeted Christian areas with the same tactics that it used in Sinjar. Whereas it succeeded in gaining complete hegemony in Sinjar (something that ended August 3, 2014), its progress has been slower in the Nineveh Plain, where Christian communities have worked hard to resist KDP incursions. However, the KDP has been persistent and patient in its quest to annex Nineveh, and achieved new victories ahead of (and continuing after) the referendum. 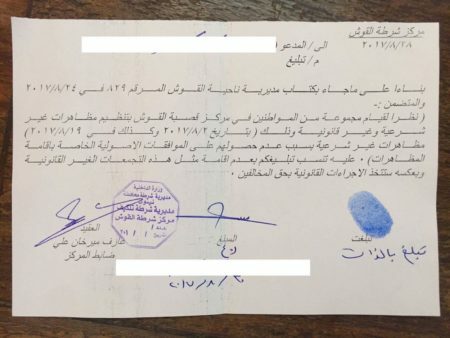 This past week, after the publishing of the Erasing Assyrians report, an image surfaced of an official document from the office of Lara Yousif, Alqosh’s new “mayor,” signed by Yousif. 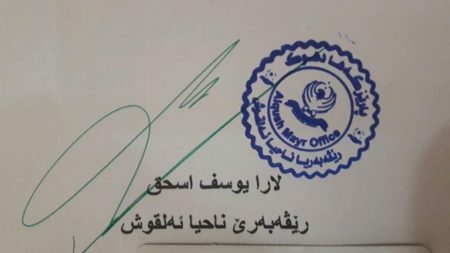 What raised eyebrows was that the stamp of the mayor’s office next to Yousif’s signature bore the insignia of the KRG and said “Dohuk Governorate” (in Kurdish). The Erasing Assyrians report warns about the danger of the annexation agenda, and this image makes that agenda plainly evident. The KRG has now annexed Alqosh; it is not attempting to disguise the nature of this takeover but is revealing the new arrangement on documents issued by the new authority in this town. Keeping in mind the KRG’s current emphasis on independence, we may be seeing future borders being drawn at present—if this situation is left unchallenged by the international community. The fact that the KDP has infiltrated one of Baghdad’s governorates and is now using that platform to “legally” migrate disputed territories out of that same governorate’s jurisdiction and into the sphere of KRG administrative and security structures amounts to the KRG using Iraq’s own institutions of governance in non-Kurdish areas to prepare parts of Iraqi territory—outside of the KRI—for eventual secession from Iraq. The Erasing Assyrians report can be consulted for more detailed information on the makeup of the provincial and district councils that were manipulated by the KDP to effect the change of power in Nineveh that occurred this summer. The Assyrian activist Max Joseph also wrote an article chronicling the removal of Nineveh’s mayors, which can be consulted. 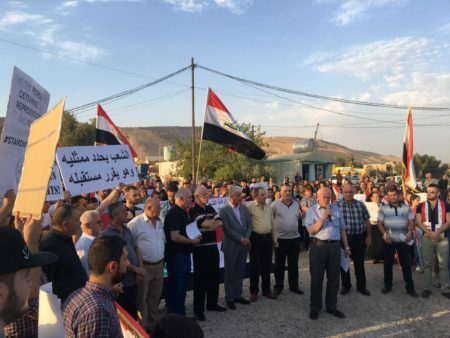 Opposition to what has transpired in Nineveh this summer has been met with threats against protesters, legitimized and delivered by the same councils responsible for deposing the elected mayors. These actions represent a crackdown on free speech. [30-31] The residents of Alqosh have staged three protests since Jahwareh was removed. The first took place on July 20, 2017. The second was held on August 2, 2017 following Yousif’s appointment, and the third was held on August 18, 2017. 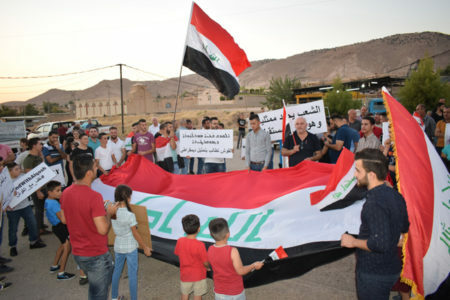 In all three protests, residents carried Iraqi flags in response to the KRG’s stated objective to conduct its upcoming independence referendum in the Nineveh Plain. 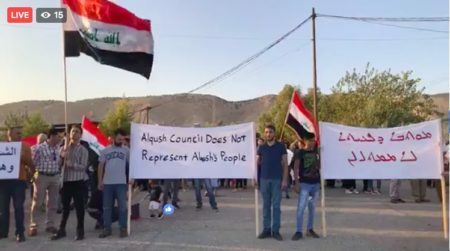 A petition was also signed by thousands of Alqosh residents and delivered to the District Council, but they have failed to respond to the petition or the protests. [31-32] On August 30, 2017, Alqosh police delivered individual notices to eleven Alqosh residents, warning them against further protests, threatening consequences. The notices were sent by the office of the town’s newly-appointed mayor, Lara Yousif. [These] individuals were identified as the “ring leaders” of the Alqosh resistance. They were asked to sign a notice acknowledging they understood there would be consequences if they failed to comply. All eleven initially refused, but a few signed the following day after being pressured by officers in their own homes. 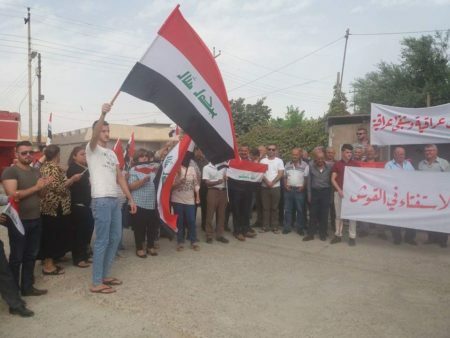 Documentation was secured from the local police station confirming that the order to threaten the protestors came from the Tel Keppe District Council, and had been approved by the Nineveh Provincial Council leader. In an interview conducted during the preparation of this report, one of the individuals targeted with the notices reported receiving death threats from Yousif’s husband, Duraid Jameel Tezi, also a KDP member. The following are some images of the protests that occurred in Alqosh. Multiple protests took place and most of the community participated. The police were aware of the protests and were present at them, and the protests were also covered by the press. The patronage system involves offering visible community figures a regular cash payment that is often referred to by people in the country as a “party salary.” These figures are then expected to publicly and privately endorse and promote the KDP and its agendas within the community. This process has the destructive effect of eroding the legitimacy of both spiritual and political leadership within minority communities, as clergy and political leaders are alike targeted with this “political conversion” effort, amid the deep frustration of the people who then feel abandoned by their representation. The pattern is that without this financial bribery, it is difficult for the KDP to make inroads with communities whose interests are not served by KDP objectives. Usually, only the loyalty of the figure receiving the salary—and that of his inner circle of friends and relatives—is bought by the party; these figures are then generally rejected by a majority of their community, but because the KDP is able to “convert” most of the visible leadership figures, it still succeeds in creating the illusion that a sizable portion of the minority population stands with the party. In the case of the Yazidis, the effects of this patronage system have so destabilized traditional leadership structures that the people often express despair at not having anyone in their community to speak for them. Yazidi tribal heads, religious leaders, intellectuals, and professional figures are all targeted with this form of politicization. This has had the long-term effect of eliminating any prominent voices within the community that are critical of the KDP and that could rally broad support for Yazidi interests, even though the Yazidi people frequently share with concerned outsiders that this is what they most need. All Yazidis MPs in the Kurdistan Parliament are KDP members—as are Yazidi MPs in the Iraqi Parliament who represent the KRG—but they enjoy little esteem from the Yazidi community and are often the objects of scorn. 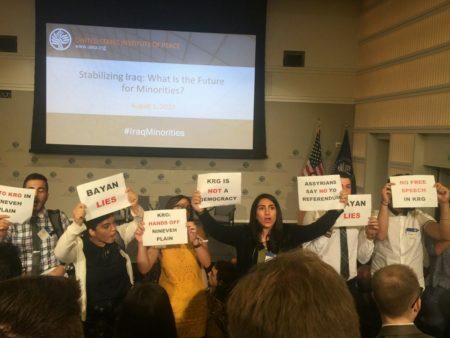 The existence of independent Assyrian parties has allowed Assyrians to resist this process somewhat more effectively than the Yazidis, whom the KRG denies the right to create parties, using the rationalization that “Yazidis are Kurds, therefore they can participate in Kurdish parties and have no need for separate representation.” This justification for proscribing the Yazidi political voice is ironic in light of the fact that three main Islamist parties legally function in the KRG and hold seats in the Kurdish Parliament—these are Kurdish parties whose platform is religion and religious identity. The KRG has entrenched an order  by which Yazidis who want to participate in politics are forced to join the established Kurdish parties that are not sensitive to the unique concerns of the minority, but which advance the broad Kurdish interests that constitute their platforms. The only alternative to this for Yazidis has been one Yazidi party in Sinjar (called The Movement of Reform and Progress) that has sought to work directly with the Central Government in Baghdad. It holds one seat in the Baghdad Parliament, but for more than a decade it was harshly suppressed by KDP asaish who threatened, abused, and arrested most of its members. This was possible because of the de facto security control that the KDP maintained in the disputed territory of Sinjar until the Peshmerga withdrawal upon the Yazidi Genocide of August 3, 2014. Successfully thwarted and stifled by the KDP, which used its militarized security forces (something that small parties do not possess) to forcefully establish hegemony in Sinjar, the Movement of Reform and Progress is seen as a failure by Yazidis today. That the KRG has been forced to recognize the ethnic distinctiveness of Assyrians is one factor that has allowed Christians to resist KDP encroachment in the Nineveh Plain more successfully than has been the case for Yazidis in Sinjar. However, as this report explains, this resistance is weakening as the KDP continues to pursue increasingly aggressive tactics to annex the disputed territories, while shielded by the ongoing absence of sufficient external accountability that the international community could provide. This is exemplified by the cases of the removal of Nineveh district mayors, described in the previous section, which involved the KDP’s use of a number of minority beneficiaries of KDP patronage that had been appointed to Nineveh district and provincial councils. In a small oversight, the report failed to mention that a new Yazidi party has recently been created by Haider Shesho, though it is understood that this has only become possible because Haider has given up opposing KDP policies and (since spring of 2016) promotes KRG positions on incorporating Sinjar into the KRI. This is a new development and a departure from what has been the established policy of the KRG regarding the Yazidi political voice. Were Yazidis to attempt to form a party that expressed substantial opposition to KDP agendas, it is likely that it would not be authorized to exist or conduct activities within the KRI or KRG-controlled disputed territories. Despite ardent opposition from both international observers and local residents of the disputed territories, the KRG has announced its plan to include the Nineveh Plain in its upcoming independence referendum scheduled for September 25, 2017,105 referring to it as a “Kurdistani area” despite the fact that the Nineveh Plain is outside its jurisdiction and has never had a sizeable Kurdish population. Analysts have noted that it is extremely problematic to unilaterally conduct an independence referendum in disputed territories that have not yet been established as part of the Kurdistan Region—how can inhabitants of areas outside of the KRI legitimately decide whether Kurdistan should secede from Iraq? 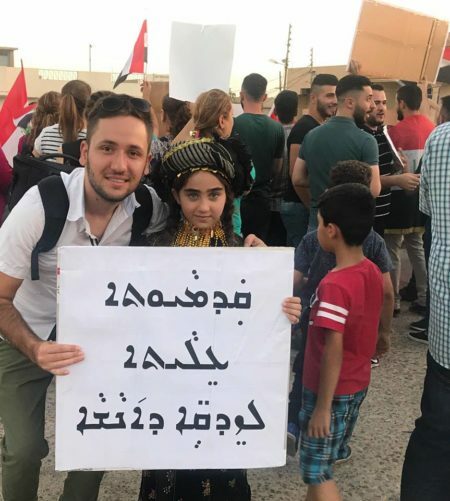 In recent months, the Assyrian Democratic Movement has repeatedly called for the Nineveh Plain to be excluded from the controversial referendum, given the current situation. Assyrian politicians have maintained that the people of the Nineveh Plain should not be asked to participate in any such referendum until they have had the opportunity to return home, rebuild their towns, and regain stability. Nineveh Plain residents feel that KRG authorities are exploiting the suffering of minority communities to advance their own interests, but recent developments described in this report are only the latest actions in a long-term strategy to annex the region. One of the favorite talking points parroted by KRG lobbyists when issues of human rights abuses are raised runs along these lines: “We know that we’re not perfect, but we’re making so much progress, and we hope that others will note that we are doing so much better than other regimes in the region.” This is quite the weak standard of comparison. It is unacceptable to invoke Bashar al-Assad, Erdogan, Saddam or Maliki, and Iran to avoid facing one’s own human rights failures. The report contains detailed information on a number of important issues in addition to those excerpted above. These include abuses of the Kurdish asaish, government-sanctioned expressions of anti-Assyrian prejudice, and other forms of discrimination in business and politics. Readers are encouraged to consult the report for any information that may prove useful. The KDP takeover of parts of Nineveh is not something that should be tolerated by the international community. It is unacceptable to allow the unilateral division of disputed territories like Nineveh and Sinjar between Baghdad and the KRG, permitting each government to administer a part of them. This trend divides communities whose survival is already vulnerable and whose historical cohesiveness is being undermined—due to the politics of nationalism—to a greater degree than at any time in the past. The recent history of theft of Christian land under Kurdish governance, in addition to the other abuses outlined in this report, should make clear that KRG administration of Nineveh is not a guarantee for improved stability and longevity for Christian minority communities. We may currently be witnessing just another stage in the longer-term trend of the disappearance of this people from their homeland. When the KDP successfully co-opts a small portion of a minority community, it then advances the claim that the vast majority of the group supports Kurdish administration and that only a handful of “troublemakers” oppose it. But as numerous journalists have reported and as anyone who has spent time visiting communities in northern Iraq is aware, the vast majority of Christians in the Nineveh Plain (like the vast majority of Yazidis of Sinjar) prefer to develop their own forms of local administration and security, legitimized under the appropriate Iraqi ministries. This is not about any particular affinity with Baghdad, but the fact that as part of Iraq, these local regions have the opportunity to develop forms of local governance; annexation to the KRI, on the other hand, will almost certainly turn these areas into KDP fiefdoms. The international community should support the demands of these peoples—rather than dignifying the party policies repeated by their unelected “leaders”—and facilitate this process.